Hello Jim - Can we make better business models for the Internet? If you have read some of my other blog posts before then you may already be aware that I am passionate believer that there are plenty of new business models that simply weren't possible in the Pre-Internet Era. The problem is that much of our current Internet usage is underpinned by the same business models that evolved from an industrial revolution and in many cases have proven themselves already to exacerbate problems surrounding personal privacy, over-consumption and wealth inequality amongst many others. A massive proportion of our free Internet usage is subject to all of us openly accepting ourselves as simple datapoints that can be monetised for marketing and can then disrupt much of our daily Internet use (and beyond). Surprisingly many people I have spoken to, don't seem to mind. But I do. The opinion many hold is that it is a fair trade-off and they subscribe to the old adage of "if you can't beat them join them". Friends have told me "if you are going to have this anyway, then it's better to volunteer your information and reap the benefits as much as you can". OK.
"People have really gotten comfortable not only sharing more information and different kinds, but more openly and with more people,"
The issue here for me is mainly to do with transparency. In any form of exchange it is only fair when the actual value of the exchange is crystal clear to both parties. Generally some due diligence is performed to weigh the value proposition for both parties until they are comfortable that the exchange is of the same value or one which they feel is a balanced trade. However when you give away your data online you have no idea of its value - this is a single transaction by you which will benefit the other party countless more times than you if you have agreed that this data can be resold. In fact it can be used over and over again by 3rd parties, selling to us, pushing more things at us and there are many companies out there who simply trade on people's personal data and make a great of money in the process. As we have seen in Europe and by the ICO here in the UK, it's a tricky beast to contain and whilst the sharks are out, you can bet they will not hesitate in squeezing every last penny from your details with little to no attention as to your privacy and personal preferences. With this argument you have no idea whether you got a good deal or not. It's too late to change this isn't it? No I don't think so. It will be difficult to control all of the data that is in the global domain already, but that is not the point of the post. The general public may seem to be getting nmore comfortable with losing their privacy, but that's perhaps because many don't fully comprehend what that means. Our privacy is being attacked on multiple fronts... I'm speaking to you from Silicon Valley, where some of the most prominent and successful companies have built their businesses by lulling their customers into complacency about their personal information. They're gobbling up everything they can learn about you and trying to monetize it. We think that's wrong. And it's not the kind of company that Apple wants to be. 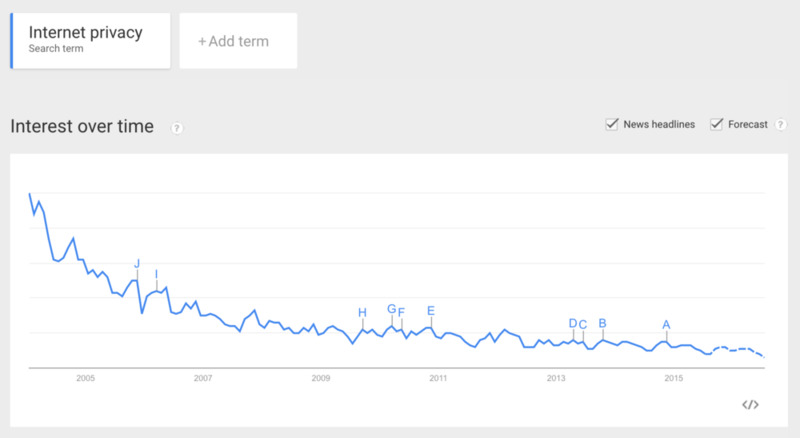 And over the last year or so it has been very refreshing to see the backlash building against data privacy invasion. From the excellent Ello Bill of Rights through to Apple CEO Tim Cook's speech in June attacking the Internet giants that are dishing up our data like the game's already up. My conviction is that us Internetpreneurs need to be investing more of our time not only creating and building products and services, but also importantly we need to focus an awful lot more on building and designing ethical, sustainable, social, scalable and profitable business models that benefit the world. Interestingly whilst working with a start-up at an accelerator programme in Berlin a few year ago, I witnessed another significant problem that seems to affect many young upstart tech companies - investors only liked the tried and tested business models that made commercial sense to them. The ones that they had seen before. There was a lot of kickback when talking about experimental business models which is interesting given the fact that most are looking to "disrupt"! So herein lies another problem. Incredible amounts of start-ups right now are chasing Venture Capital to be The Next Big Thing and ultimately get very rich. And as we already know the primary purpose of a Venture Capital company is finding the next big multi-bagger investment. They need a big financial exit. And finally, when the company IPOs it needs to keep growing to please shareholders. Let's say that our newly IPOed business has been built with typical online advertising as it's core business model. As a fledgling company perhaps this isn't too bad, but gradually, as the demands for profits grow ever and ever higher, that beast must be fed. More data must be collected about users to increase the platform's advertising value. And more advertising must be pushed at users to generate the income... until eventually one day enough is enough and people walk away. This is the tightrope companies like Twitter do daily right now I believe. Personally I feel more and more that these problems are related to using outdated business models online and it's the piece of the complex jigsaw that often gets left until last - when it is too late. These companies employ the world's best at everything. But in their scrappy younger days, the models they were built on were critically not as well engineered as the rest of their product. If you haven't before you should read this article about the founders of Kickstarter.com as although they are using a classic offline business model, it is beautifully engineered to fit the criteria of the Internet era and is still a radical break from the advertising model. "Our investors understand that we want to stay independent forever. We have no intention of selling this company or doing an IPO." I may be proven wrong, but from my perspective to invest in Kickstarter with their long-term strategy showed some serious foresight from their investors. Over the next few weeks, I am going to write a post that outlines the business model behind Immersify (you can already see the early stages of this model through my posts about 'taskfunding' as a concept). Hopefully this has given you at least some food for thought and perhaps even inspire a little bit of your time to think on new business models that can excite an entire industry!